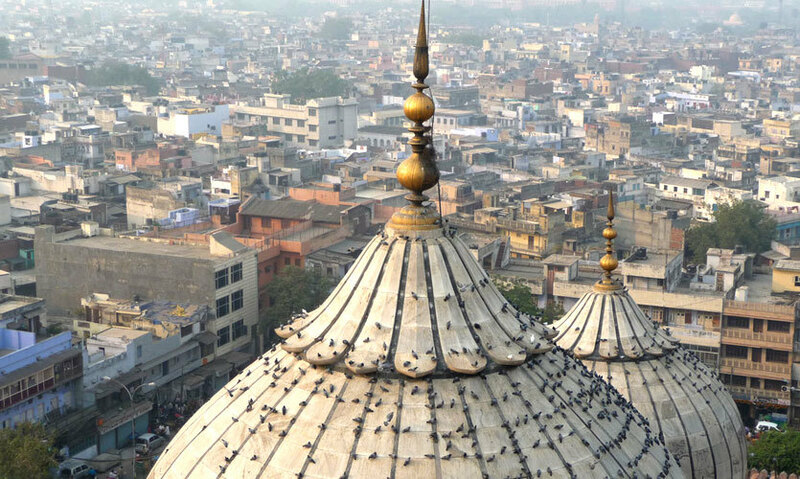 Located in the heart of the fabled old city of Shahjahanabad – the capital city of Mughal Emperor Shah Jahan – Jama Masjid in Delhi is one of the most famous tourist sites across India. Being the largest mosque in the country & one of the largest in the world, it can accommodate a whopping 25,000 worshippers at one time. A true architectural marvel built in red sandstone & marble, the mosque was Emperor Shah Jahan’s principal place of worship. It is said to have been built by 5000 odd artisans over a period of six years, at an overall cost of 1 million rupees, culminating in 1656 AD in the beautiful structure that stands there today. It has entrances in three directions, of which the North & South Gates are regularly used by visitors while the East Gate, right across the road from the Red Fort, is opened on every Jummah (Friday). Each of the three entrances has a towering gateway of red sandstone. People often wonder why Fridays are so important to Muslims. According to a learned man at the mosque, the Quran proclaims the Friday to be that one day of the week when Allah grants all prayers & bestows special blessings upon his followers. Hence Muslims leave all business as soon as the call for the Jummah or Friday noon congregational prayer is made & gather at a mosque in supplication. It is further believed that missing out on three Jummahs in a row causes a seal to be set onto the wayward’s soul. Along the perimeter of the courtyard-run-pillared corridors, at the centre of the courtyard is a small tank of water. In one corner of the courtyard, corn & seeds are always strewn about for birds to feed upon. Indeed the area is always crowded with flocks of pigeons. The North Gate houses a cabinet that holds Prophet Muhammad’s relics, such as the Quran written on deerskin, His sandals, His footprints preserved on a marble block and a strand of His beard hair. The large prayer hall facing the South side has 11 arched entrances, with the central one, being really wide & high, acting as the main entrance. 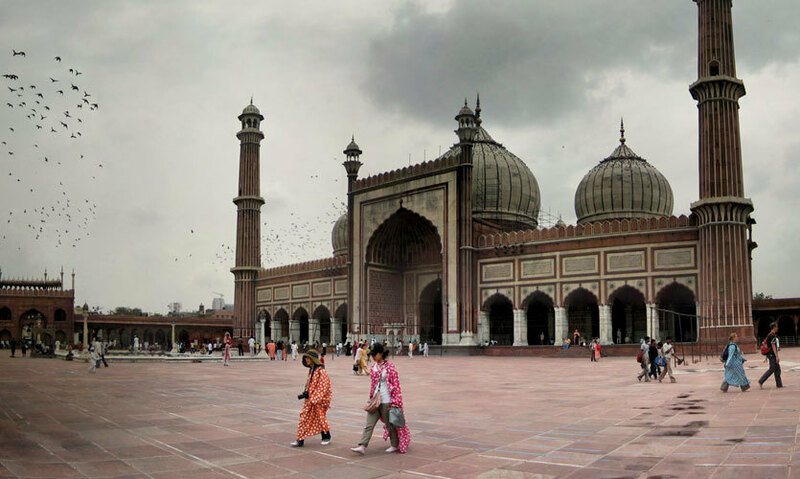 It is flanked by towering minarets in the two corners. Another big hall faces the West with 7-arched entrances. There are three huge domes on top of the mosque, with beautiful alternating stripes of black & white. The floor of the mosque is made of black & white marble imitating the prayer mat of the Muslims. All over the walls are panels inscribed with verses from the Holy Quran. 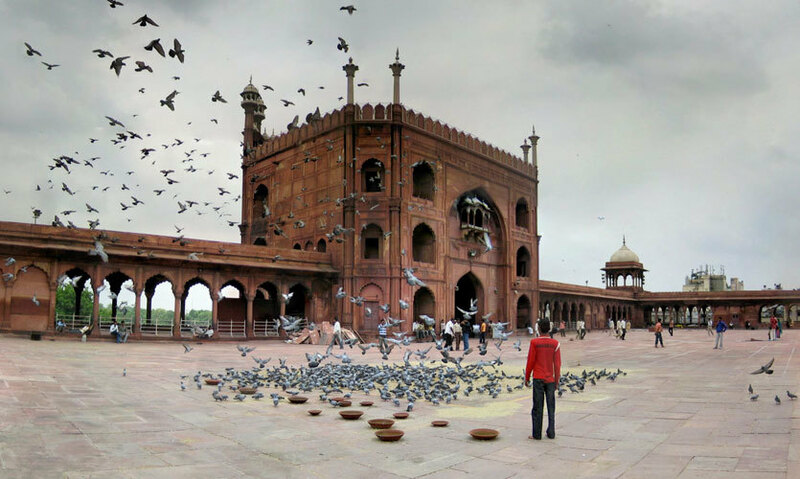 The Jama Masjid is located around 30 ft higher than the surrounding area. Standing in the middle of a bustling neighbourhood of Chandni Chowk, it is surrounded by a huge market selling all sorts of things, ranging from clothing to food & snacks; motor parts to books & stationery. Visitors are required to be fully clad while entering the mosque & to surrender their footwear at the entrance. To carry photographic equipment inside one needs to buy a ticket for Rs 200. To reach the place, one may take a rickshaw from any of the Chawri Bazaar or Chandni Chowk Metro Stations, or cover the 5 minute distance on foot. Now that you know all about this beautiful and monumental place of worship, go explore it for yourself!